For the past few months, local CFUW clubs have been raising funds for CARE Canada’s child and maternal health projects in developing countries as part of our annual “International Women’s Day fundraising project”. So far approximately $3000 have been raised, which is about one third of the way to our $10,000 goal. For each dollar donated, the Government of Canada (through the Muskoka Initiative) will match it with three additional dollars. That means that if we are collectively able to raise $10,000 it will become $40,000 for CARE’s maternal health programs! 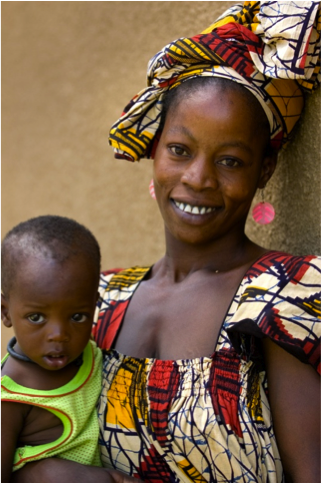 With only a month left before the end of our fundraising efforts, we’re asking club presidents to challenge each CFUW member to donate $2 for Mother’s Day to support child and maternal health in developing countries. Let’s be a part of reaching Millennium Development Goal No.5 by helping improve maternal health through CARE’s projects. Tax receipts will not be issued by CFUW or CARE Canada. This entry was posted in Uncategorized on April 27, 2012 by cfuwadvocacy. Tomorrow (April 26th) the House of Commons is set to debate Motion 312, which seeks to set up a special parliamentary committee to determine if human rights should be extended to fetuses. While on the surface this may sound relatively harmless, it is in fact a backhanded attempt at reopening the debate on abortion, and could result in criminalizing some activities of women during pregnancy. A group called the Radical Handmaids organized a rally on Parliament Hill to oppose the motion. 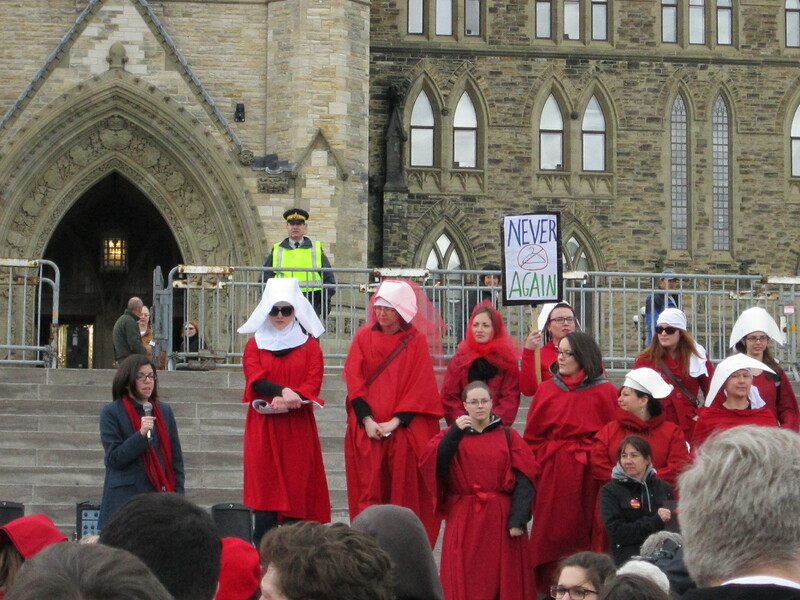 Pictured above is Niki Ashton, newly appointed Status of Women Critic for the NDP, alongside the Radical Handmaids. Ashton gave an impassioned speech stating her intention to stand up for women’s right to choose. Also pictured, is a Radical Handmaid holding a sign with the image of a coat hanger along with the message “NEVER AGAIN”. Prior to the decriminalization of abortion in Canada, women used to resort to using coat hangers to deal with unwanted pregnancies. This serves as a warning to politicians about some of the risks associated with turning back the clock on women’s rights. I am writing you today on behalf of the Canadian Federation of University Women (CFUW) to ask that the Government of Canada oppose MP Stephen Woodworth’s motion M-312, which is scheduled for debate on April 26, 2012. The motion calls for a special parliamentary committee to examine whether the Criminal Code’s definition of when a child becomes a human being should be changed to extend legal personhood to fetuses. If this were to happen, it would ironically remove women’s rights as full human beings, and possibly even criminalize their decision-making during pregnancy. This motion appears to be an attempt on the part of Mr. Woodworth to reopen the debate on criminalizing abortion. There is no other reason that Mr. Woodworth would want to discuss the extension of human rights to fetuses, independent of women, other than to seek assurances over their “right to life, liberty and security of the person” under section 7 of the Charter of Rights and Freedoms. The law has always treated a pregnant woman and her fetus as one person. The courts have stated that the intimate connection between a woman and her fetus cannot be considered in isolation, and that giving rights to fetuses would impose a duty of care on a pregnant woman that would result in extensive and unacceptable intrusions into her bodily integrity, privacy, and autonomy. Not only would fetal personhood seriously undermine the constitutional rights of women who need abortions, but also the rights of any pregnant woman. This is because it would invite the prosecution of pregnant women for any perceived harm to fetuses by creating confusion around how child welfare laws and policies apply to fetuses as legal persons. In the United States, hundreds of women have been prosecuted because of so-called fetal homicide laws and thousands more have been subjected to punitive and counterproductive child welfare interventions that treat what women do or experience during pregnancy as evidence of child neglect or abuse. The issues raised in this motion have already been addressed by Canada’s Supreme Court (including in Tremblay v. Daigle, Dobson v. Dobson, Winnipeg Child & Family Services v. Ms.G.D.F., Borowski v. Attorney General of Canada, and R. v. Morgentaler). Please do not let Canada start down the same road as the United States. CFUW urges the Government of Canada to oppose this dangerous motion. CFUW is a non-partisan, voluntary, self-funded organization of close to 10,000 women university graduates, students and Associate Members in 112 Clubs across Canada that works to improve the status of women and human rights, education, social justice, and peace. CFUW holds special consultative status with the United Nations (ECOSOC) and belongs to the Education committee of the Canadian Sub-Commission to UNESCO. CFUW is the largest of the 61 affiliates of the International Federation of University Women (IFUW). This entry was posted in Uncategorized on April 25, 2012 by cfuwadvocacy. At the Canadian Federation University Women’s 2010 AGM we adopted a policy resolution calling on the Government of Canada to ban the mining, use and export of chrysotile asbestos. 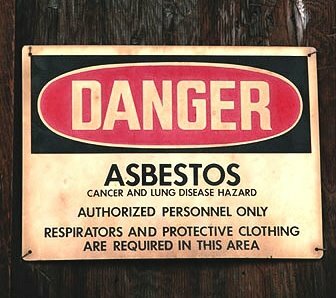 Despite several attempts on the part of CFUW National, and many leading health associations, the Government of Canada has not yet been persuaded to ban asbestos. With more information available about the dangers of chrysotile asbestos we need to expand our efforts by placing pressure on individual Members of Parliament belonging to the governing party (i.e Conservatives) and the Bloc Quebecois. Members of the NDP, Liberals and Green Party have already demonstrated that they support instituting a ban, as was evidenced on November 1, 2012, with a 152-123 vote on a motion to ban the use and export of asbestos. Members of Parliament respond to contact from their constituents. We encourage Presidents of CFUW Clubs across Canada to contact their MPs by letter, email, telephone, personal visit or social media to enlist their support. Individuals can contact their MPs without speaking for CFUW, and invite their friends to do so as well. Contact information for MPs can be found at http://canada.gc.ca/home.html. Click on ‘Members of Parliament’ and enter ‘members by postal code’ as a search. This entry was posted in Uncategorized on April 23, 2012 by cfuwadvocacy. (OTTAWA, April 17, 2012) – Today, the Canadian Federation of University Women (CFUW) celebrates the 30th Anniversary of the Canadian Charter of Rights and Freedoms. This momentous occasion is close to the hearts of many of our members, some of which were involved in the push 30 years ago to have equality rights recognized in the Constitution. While the Charter of Rights and Freedoms became part of the Constitution on April 17th 1982, it was not until 3 years later that section 15, recognizing equality rights, came into effect. While there have been many success, there are still several cases that have been brought forward to the courts for the purposes of advancing gender equality that have been unsuccessful. And today we are seeing many more cases being brought forward. Prior to 2006 equality seeking groups, including women, were given assistance through the Court Challenges Program to bring forward important equality rights cases. Since the Government of Canada withdrew all funding for the program, there are very few supports left. Now there are only a handful of organizations like the Women’s Legal Education and Action Fund (LEAF), and some pro-bono lawyers who are willing to take on cases, but the costs can still be astronomical. Time and resources are limited. The Charter of Rights and Freedoms has certainly been a huge step forward for women’s equality in Canada, however it is also important to recognize that there are many other issues that go beyond the scope of formal legal equality, such as universal access to affordable child care, the feminization of poverty, and bringing an end to gender based violence, to name a few, that must be addressed in order for women to be truly equal. This entry was posted in Uncategorized on April 17, 2012 by cfuwadvocacy. OTTAWA (April 2, 2012) – The potential impacts of Bill C-19 on women facing violence will not be reviewed by the Senate before it votes on the bill to dismantle the long-gun registry. Service providers supporting abused women and women’s organizations from across Canada, including the BC Society of Transition Houses, the Alberta Council of Women’s Shelters, Manitoba Association of Women’s Shelters, the Ontario Association of Interval & Transition Houses (OAITH), Fédération de ressources d’hébergement pour femmes violentées et en difficulté du Québec, Transition House Association of Newfoundland and Labrador, PEI Family Violence Prevention Services, the Regroupement des maisons pour femmes victimes de violence conjugale, the Transition House Association of Nova Scotia, the Ottawa Coalition To End Violence Against Women (OCTEVAW), and the Canadian Federation of University Women (CFUW) reacted with shock at the Senate’s decision to close their study of Bill C-19 – Ending the Long Gun Registry Act without hearing from professionals working with women facing violence. Despite requests to appear from a number of violence against women (VAW) service providers, the Senate Committee on Legal and Constitutional Affairs did not include a single one among 30 witnesses they invited to appear. The Committee heard testimony from witnesses over four days. On the final day of presentations, March 29th, three panels had originally been scheduled; however this was changed to two panels at the last minute, indicating time was available in the schedule for additional witnesses. Shelters, transition houses and other groups working to end violence against women are deeply concerned about unexpected provisions in Bill C-19, which, will not only dismantle the long gun registry, but remove mandatory verification of a buyer’s licence when purchasing a gun, and end requirements for firearms dealers to maintain records of sale. “Many people are unaware that these changes are in the bill, and that they could have severe ramifications for the safety of women and children” said Stefanie Lomatski, Executive Director of OCTEVAW. Amendments to close these dangerous loopholes in Bill C-19 were rejected at Committee in spite of witnesses repeatedly stressing the added risk to public safety. “This bill seriously weakens the ability of police to remove weapons from men who pose a threat to their families, and makes it much easier for them to purchase long guns with fake or invalid licences. This is a very dangerous change for the women we serve,” said YWCA Canada CEO Paulette Senior. A prime example of the danger this poses is the 1998 Arlene May murder case. Arlene May was shot to death with a long gun her ex-boyfriend procured with a revoked license that was never removed from his possession. The Coroner’s Inquest identified the lack of mandatory licence validation as a major loophole in the system at the time. “Too many women like Arlene May have already died at the end of a long gun. Taking away protection provided by licence checks means there are sure to be many more,” said Eileen Morrow, Coordinator of the OAITH. Tony Bernardo, Executive Director of the Canadian Shooting Sports Association (CSSA) and a member of the Public Safety Minister’s Firearms Advisory Committee, used his testimony to the Senate Committee to push for more reductions in safety measures by opposing the spousal notification system that is part of the process to obtain a gun licence. Spousal notification is a critical component of the licensing system to help protect vulnerable women. “Eliminating the notification would have very obvious and serious implications for women’s safety. We are all left wondering why the CSSA is able to have such a prominent voice in this process, while women’s services providers who deal with these issues every day are excluded completely,” said Carolyn Goard of the Alberta Council of Women’s Shelters. The Senate should exercise due diligence by ensuring that the gendered impacts of the legislation are properly understood and addressed. This requires listening to the organizations that work with and represent women experiencing violence. For more information or interviews contact Tara Fischer, Canadian Federation of University Women, 613-234-8252 ext: 106. This entry was posted in Uncategorized on April 2, 2012 by cfuwadvocacy.